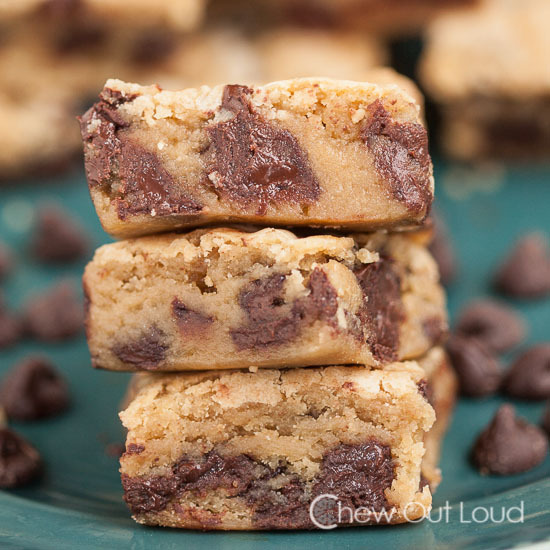 Congo Bars are a crowd pleaser because they are basically a buttery, golden, chewy chocolate chip cookie in chunky square form. Preheat oven to 325F, with rack on lower middle position. Grease and flour a 13x9 pan and set aside. In the bowl of stand mixer fitted with paddle attachment, cream butter and sugar until light and fluffy, about 3-4 minutes. Add eggs and vanilla and stir until combined. In a separate bowl, whisk together the flour, baking powder, and salt. Using rubber spatula, fold butter mixture with flour mixture just until incorporated. Fold in chocolate chips. Press dough into prepared pan, using spatula to even out the surface. Bake for 30-35 minutes, or just until top is lightly browned. It should look puffy, soft, and golden. Center will still be soft. Cool bars completely. Cut into squares. Store leftovers in airtight container at room temp.